Author’s opinion - it is highly unlikely that Tether is growing through any organic business process, rather that they are printing in response to market conditions. Tether is a “stablecoin," a token on the Omni network (overlaid on the Bitcoin network) seeking to maintain a stable value of one USD per Tether or “USDT". Tether in its current incarnation is a 2014 rebranding of Realcoin ostensibly functioning by taking USD deposits from customers and exchanging them for an equal amount of USDT. An advantage of Tether is the ability to price digital assets in USD without having USD-denominated bank accounts. Given the extreme difficulty many exchanges have faced in maintaining banking relationships around the world this arrangement is quite attractive. As of the time of writing there are 2,150,000,000 USDT in existence on the Omni network and another roughly 14M Tether denominated in Euro on the Ethereum network as ERC20 tokens. This analysis will focus on the USD denominated Tether on the Omni network. A number of worrying events have brought attention to Tether throughout 2017. In April they revealed that their banking relationships in Taiwan had been severed; this led to a general suspension of deposits and withdrawals for retail customers. April also saw the beginning of a massive expansion in the number of Tether on the market despite their self-proclaimed inability to accept deposits from non-Taiwanese bank accounts4. Early September brought denials from Tether that they were undercapitalized and promised a historical audit that is still incomplete as of this writing. They produced an internal document in late September purporting to show USD balances backing the then modest amount of ~440M USDT, a figure that had increased ten-fold in only 5 months. The service agreements and institutional names attached to these funds were not divulged to the public internal memo, a reduction of transparency since their April report establishing the names of their earlier banking partners. In November they suffered a hack which was mitigated via an amendment to the Tether network code, allowing them to "freeze" funds worth over 30M USDT. In December they announced that the existing platform would be phased out and no further deposits on the current wallets should be attempted. The highly correlated growth between Tether issuance and Bitcoin price raises several interesting questions - Is Bitcoin growth driving Tether? Is Tether issuance driving Bitcoin? If one were to assume the worst case scenario, that Bitcoin’s price has been artificially pumped up by Tether issuance, one would expect the market price of Bitcoin to be closer to $2,000 based on the trendline before April 2017 and the marked growth in Tether issuance. As a null hypothesis we take Tether at their word; the creation of new Tether is backed by USD deposited in a bank account before new USDT is granted, these purchases are distributed directly to Bitfinex out of convenience (and their co-ownership with Tether), and that the timing of the Tether grants are due to organic behavior by market participants increasing their cryptocurrency holdings. As an alternative hypothesis, we ask the question whether Tether is printing USDT unfettered by meaningful oversight, transferring to Bitfinex and other exchanges to pump the price of Bitcoin and return BTC and USD to Tether/Bitfinex controlled accounts, and that the timing of these grants are not only triggered by lower than average price movements but also followed by above-average gains in the Bitcoin price. We can review publicly available market data to examine these two hypotheses. The first and most important relationship to consider is the temporal one. When are new Tethers created and what happens to the markets immediately after? The null hypotheses are that Tethers are created by purchasers staking their USD independently of Bitcoin market conditions, and that Tether creation has no net effect on Bitcoin price. If these two hypotheses are true we should be able to look at the distribution of Bitcoin price movements over various time intervals in the past year and compare them to the price movements immediately preceding the creation of a Tether grant and immediately after the Tether arrives at an exchange, namely Bitfinex. 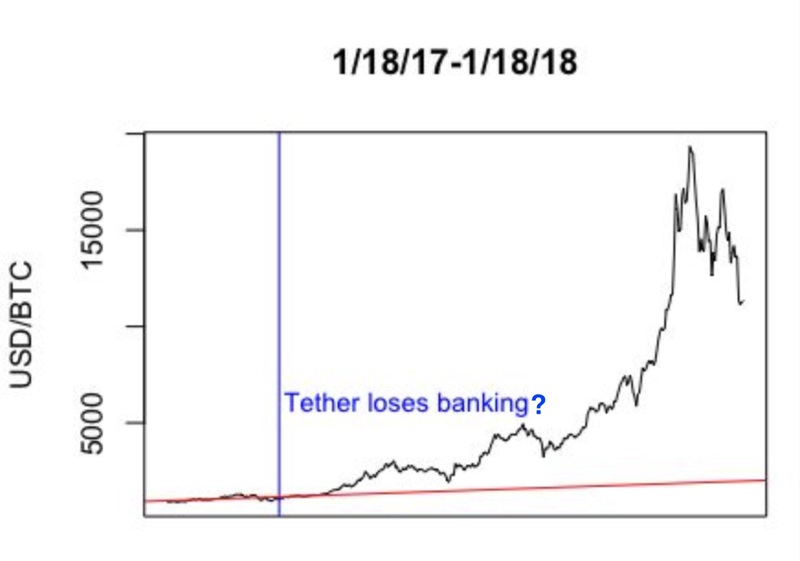 If the distributions have a statistical measure that is sufficiently dissimilar we will have to reject the null hypotheses and consider an alternative hypothesis; that Tether are created after periods of Bitcoin price stagnation or decline, and also that Tether injection at Bitfinex creates a significant rise in the price of Bitcoin. We are going to use the Kolmogorov-Smirnov test here, essentially asking if the two samples seem to be drawn from the same distribution. If Tether is issuing new tokens in response to market conditions then we would expect the distribution of conditions preceding an issuance to differ from the overall distribution. Similarly if Tether issuance is having a real effect on the market we would expect the price change distribution following the issuances to be more positively distributed than the overall price movements. To examine the grant timing hypothesis we look at the grant events over the period 3/29/17 to 1/4/18 and compare it with Coindesk's Bitcoin Price Index at an hourly resolution. This index is chosen for its public availability, resolution over that timescale, and representation of the overall market price instead of the price solely at Bitfinex. We use a discrete one-sided Kolmogorov-Smirnov test with 1000 rounds of bootstrapping, designed to ascertain whether two empirical discrete samples are drawn from the same distribution (this is used because the price changes preceding Tether issuance are a proper subset of the price changes over the entire year, leading to tie values which the continuous K-S test is not technically designed for). The alternative hypothesis is that the mean of the percentage changes preceding an issuance is lower than the set of all changes, meaning that the cumulative distribution function of the former is greater than the latter. The first sample is created by taking all timestamped Tether issuances, rounding down to the hour, and then looking at the percentage price change in the past N hours. The second sample comes from the time period 12/25/16 to 1/10/18 and looks at all percentage price changes with a difference of N hours, N being fixed for both samples. 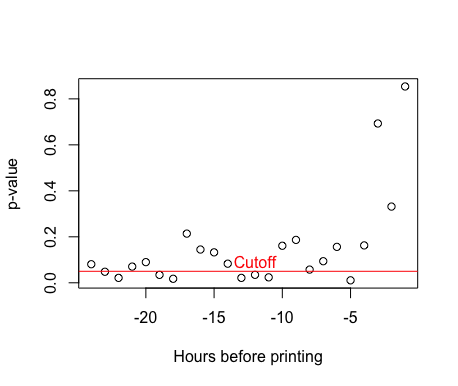 We vary N from 1 to 24 hours and examine the p-values. If the price action before Tether issuance is independent then the percentage changes should be uniformly drawn from the overall distribution and we should not see any p-values at or below 0.05, our chosen significance level. 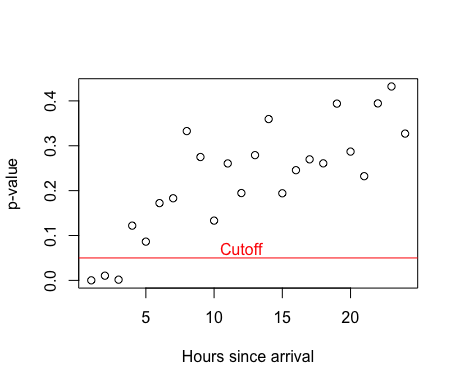 While this is true for the hours immediately preceding the issuance of new Tethers, there are a number of periods where the p-values are significantly below 0.05 and we reject the null hypothesis for those periods. Prices are significantly depressed from the overall distribution in the 12 hours preceding Tether issuance, down 0.43% on average whereas the normal 12 hour price movement averages around positive 0.42%. This suggests that the creation of new Tether is tied to the Bitcoin price, in particular to adopt the alternative hypothesis that periods of dropping or stagnant prices raise the probability of new Tether being created. If there is a relationship before Tether is granted then what is the distribution of Bitcoin price movements in the hours immediately following the movement of Tether grants from the temporary holding wallet to the Bitfinex exchange account? 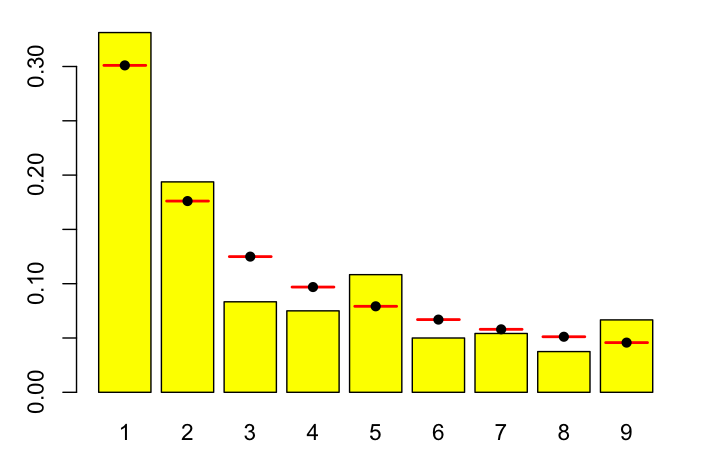 This can be answered with the same one-sided Kolmogorov-Smirnov test as before, now with the alternative hypothesis being that the distribution of price movements is greater on average than the background distribution, hence the cumulative distribution function is lower. Looking at a one hour gap after Bitfinex receives newly minted Tether, we reject the null hypothesis with a p-value of 0.0001272. 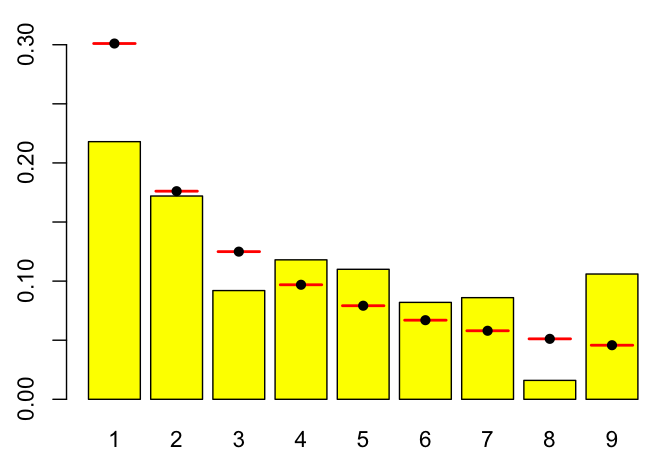 This effect is noticeable for the next two hours, with p-values of 0.01045 and 0.001617 respectively. This leads us to reject the null hypothesis that Tether is not moving the market upwards once it reaches Bitfinex. Assuming the foregoing is correct, a follow-on question is, how much can Tether move the market? This is difficult to quantify precisely for the entire market but upper bounds can be established for an individual market such as Bitfinex. For instance, one can sum the value of the open sell orders to ascertain how much it would cost to instantaneously move the market. In the case of BTC on Bitfinex it can be as low as ~$50M for a 15% upward movement, but this varies widely due to changing market conditions. Such a metric is unrealistic since more liquidity would appear from the sidelines making the total price movement much smaller, and no such extreme behavior exists to my knowledge. The likely magnitude of the effect is more subtle, though potentially magnified on Bitfinex in particular by the staking of USDT for margin positions, increasing the effective size of potential BTC purchases by a factor of 3.33. Since it is highly likely (p < 0.05) that newly arrived USDT does have an effect on the market it is perhaps best to estimate the effect by comparing the price activity after a grant with the average price action during similar time periods. If we take all the 2-hour periods after USDT grants arrive at Bitfinex’s wallet and compound them we can attribute 48.8% of Bitcoin’s price growth between 3/29/17 and 1/4/18 to those two hour blocks, totaling less than 3% of the trading hours during that time period. If those 91 different USDT arrival periods are instead replaced with the average price behavior on a 2-hour timescale the compounded growth is just 6.5%, so a rough estimate of ~40% price growth attributed to Tether is defensible. The second half of the analysis is focused on the question of whether the flurry of Tether transactions at Bitfinex following a new grant are the product of normal customer activities or something “artificial” in the vein of market manipulation. Though internal trade data would be ideal (and we do not have access to that data), we can get a measure of the validity of transactions surrounding Tether creation by simply examining the leading digits of the publicly available deposit and withdrawal transaction sizes. This method is associated with a statistical principle known as Benford’s Law and is a powerful tool in forensic accounting and as a red flag for potential further investigation. 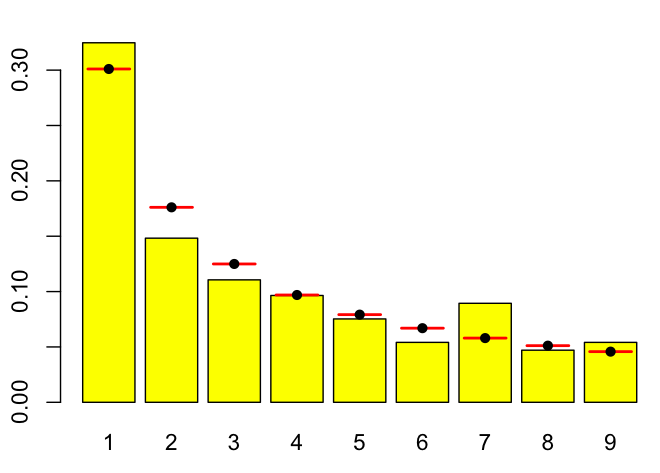 Briefly, Benford’s Law states that the leading digits of most natural number sets are not evenly distributed but instead have an overrepresentation of smaller digits. 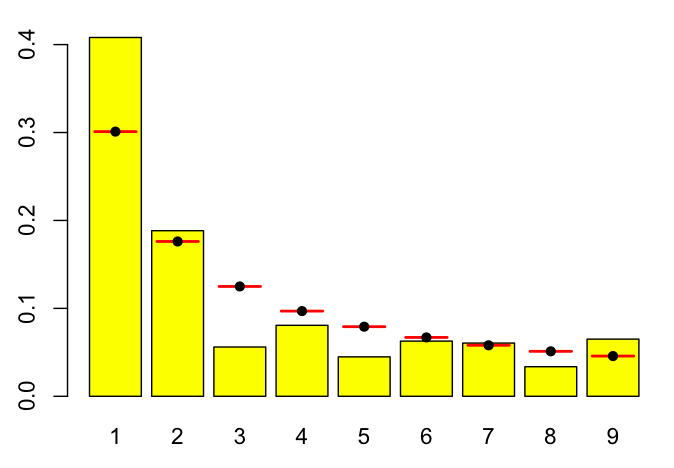 This effect is noticeable when the numbers involved range through several orders of magnitude, have no artificial structuring, and are of a large enough sample size (typically over 100). Counterexamples are phone numbers or Social Security numbers that are of a fixed length and assigned to fill a unique space; good examples include river lengths, town populations, number of Twitter followers, national GDPs, corporate accounting statements, and especially financial transactions. To evaluate whether a set of transactions conforms to Benford’s Law we look at 500 sequential transactions pulled from OmniExplorer for various Tether wallets. 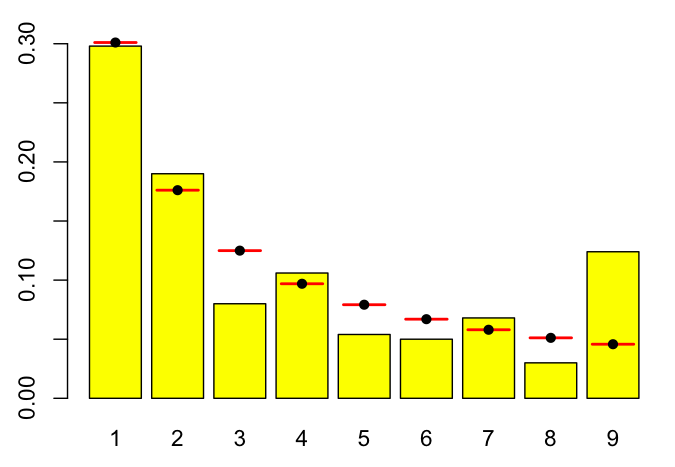 We look at the frequency of the 9 different leading digits and evaluate whether they conform to the target distribution with a chi-squared test with 8 degrees of freedom. This gives us a p-value to accept or reject the null hypothesis that the data is following Benford’s Law. Before evaluating Bitfinex’s wallet it is instructive to look at an example that does conform, namely the Bittrex deposit wallet. In this case the test generates a p-value of 0.19, meaning that there is a 19% chance the Bittrex data conforms to the Benford’s distribution. This isn’t a perfect fit but it certainly isn’t enough to reject the hypothesis and well within the overall shape of the distribution. 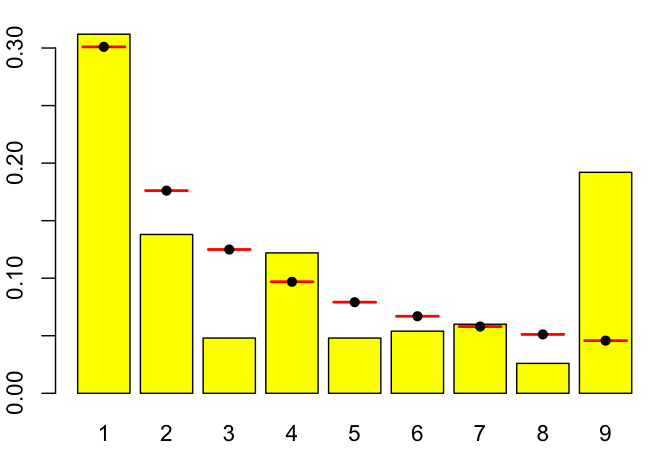 The yellow bars indicate the measured frequency and the red and black markers indicate the hypothetical distribution. Moving on to Bitfinex’s wallet on 1/4/18, in the time period surrounding that day’s Tether print, we see a significant deviation, with a p-value of p = 6.565 x 10-15. This indicates a rejection of the null hypothesis that the transactions are naturally distributed. This pattern is not transitory and is similar during a later Bitfinex grant event on 1/14/2018, with a p-value of 2.2 x 10-16 conflicting with the Benford’s distribution. Overall there are some very interesting patterns at play, especially the overabundance of leading 9’s and a uniform paucity of leading 3’s and 8’s in the transaction data. For all of these different exchanges to exhibit not only extremely significant deviations from the shape of natural transaction data. The same deviations raise red flags and leads one to question whether coordinated market manipulation could be occurring. What could all of this imply? The price data suggests that Tether may not be minted independently of Bitcoin price and may be created when Bitcoin is falling; it also rejects the notion that Tether is not having a great influence on the Bitcoin price. One interpretation of the data suggests that Tether could account for nearly half of Bitcoin’s price rise, not even allowing for follow-on effects and the psychological effects of rallying the market repeatedly. The transaction data could trigger extreme scrutiny and audits due to a questionable pattern of transactions. One might question the very appearance of these transactions (Are they contrived? Are they irregular?) and, in turn, the legitimacy of the circumstances surrounding Tether’s creation and distribution through the exchange ecosystem. There is, of course, a great deal of proprietary data not included and unavailable for this analysis and this report, and could answer the questions posed herein. The statistics presented herein do to not establish wrongdoing but merely give rise to the opinion that the observed behavior appears questionable and should be further examined. It is possible that Tether operates exactly as claimed, but we call upon them to conduct an audit and share additional meaningful and reasonable information about their business operations. 1) Conduct an audit by a reputable auditor. Considering the scale of the operation it would be best to engage an organization of the highest reputation, such as one of the Big Four. Release a statement from Tether that this audit has been initiated and have the auditing firm confirm this. 2) The audit does not solely include a snapshot of accounts on a single date. It should also confirm that each Tether is backed by a dollar now and was for all points in Tether's history. More than confirming that accounts of the proper amount do and have existed, the nature of those accounts and the service agreement between the banks and Tether should be divulged to show that these accounts exist solely for the benefit of Tether holders.